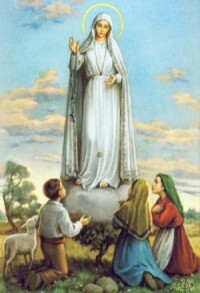 When the Blessed Virgin Mary appeared to three children in Fatima, Portugal, she held a rosary in her hand and identified herself as ‘The Lady of the Rosary’. During her second of six monthly apparitions, the Lady instructed them to ‘Say the Rosary every day, to obtain peace for the world’. The 13th Day will be released in the US cities of Atlanta, New York, Denver, Chicago, Austin, Fortworth, Oakland (CA), and Orlando. The film's North American distributor, Catholic publisher Ignatius Press, "will host pre-release screenings of The 13th Day to Catholic leadership on October 13, the anniversary of the final apparition...If you are a Catholic leader, you can sign-up for a screening in your area by visiting www.CatholicScreenings.com." The DVD will be available December 1, 2009.
cousins, Francisco and Jacinta Marto. Over six months, Our Lady gave incredible prophecies and warnings to the children that included a harrowing vision of hell, the timing of World War II, the spread of communism and the attempted assassination of a Pope, who later was revealed to be Pope John Paul II. Stylistically beautiful and technically innovative, the film uses state-of-the-art digital effects to create stunning images of the visions and the final miracle that have never before been fully realized on screen. Shot on location in Portugal and in the UK, the film has a cast of hundreds to re-create the scenes of the 70,000 strong crowds of witnesses, with three young Portuguese actors playing the iconic roles of Lucia, Francisco and Jacinta. 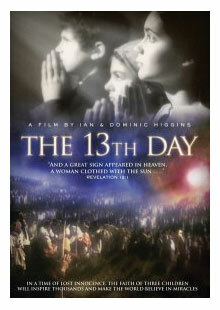 Says Anthony Ryan, Director of Marketing for Ignatius Press, "The 13th Day is an antidote film for our time. It is a reminder that a thin veil exists between our world and the next. 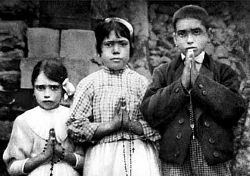 The Message of Fatima is a relevant wake-up call to a culture torn apart by abortion, war, and injustice. Every Catholic, perhaps every person, should see this film"."